As a stay at home mom, I've always had to get a little creative to get writing in. It was easier when my daughter wasn't mobile and my son still took daytime naps. As the kids have gotten bigger, I've had to adjust. Write-ins for NaNoWriMo were great for getting me out of the house and keeping me focused on sitting down to write. Preschool for my older child has given me a little more flexibility as well. But now it's summer vacation and both kids are home 24/7. Maintaining my writing momentum while spending all of my time with two little kids is hard. I could take a vacation from writing endeavors for the summer, but my sanity would seriously suffer without an outlet. Instead, I had to find some other solution which would give me time to write. With anything you really want to do, you have to make time. It's easy to get so busy with other things and lose sight of keeping up with your current WIP. 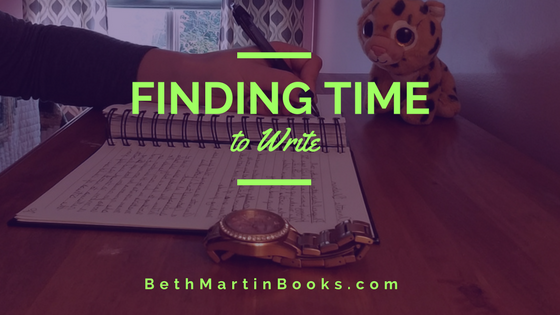 Well take it from a busy mom of two: If I can make time to write, you can too. So here are some tips on carving out some time and finishing your novel (or any other project that just isn't getting done). This is my summer solution. Even though my son is out of school and at home all the time, so are all of the other students. I've been very fortunate to have a neighbor come play with the kids just a few hours a week which gives me the opportunity to haul up in my room and type my heart out. In my case, I believe good helpers deserve to get paid, so this isn't a free solution. But if you have family in town or can do a trade of some kind, you may be able to get babysitting for free. If you can be productive early in the morning, then use that time to get some writing in. I know not everyone in a morning person--when my husband wants to get things done, he waits until the rest of us are in bed in order to get some peace and quiet. Whether earlier or late, it's possible to offset your schedule a little in order to take advantage of everyone else being asleep. In the case of kids, they sleep more than an adult, so you'd just want to use those glorious kid-free hours for writing. Seriously. Block off time on your calendar for writing. Bonus if you set up notifications to remind yourself when it's time to write. This is especially helpful for people who are forgetful or have free time and find themselves using all of it for Netflix binging. Hopefully after a while, writing at a specific time will become a habit and you won't need the schedule forever, but this can be a good way to start. In the end, you're just one person. You can't do everything. Decide which activities you participate in are the most enriching and put away the rest. I use to try all kinds of DIY stuff, but with two kids to take care of, I didn't have the time to devote to it. In the end, I picked three things (and writing is one of them) that I enjoy and wanted to do well and stuck to those. I use to have a rubber stamp collection and do watercolors, crochet, and music composition. By making the conscious choice to set those things aside, I don't feel bad about not getting around to finishing that blanket and I have the time to devote to the things that I find more fulfilling. These are my tips for making time to write. I hope you found at least one of them to be helpful.